I will soon be back with some mountain biking content again, but before that some ponderings about choosing a kayak, since that is what I've been looking at once again. Firstly, this is all from my point of view. Someone of average height (and to a lesser extent of average weight) has a lot more to choose from, but alternatives for me is a rather short list. I'm 192 cm tall (almost 6' 4" in American) and weight around 100 kg (220 lbs). I could definitely loose a little weight, but I'm still in the normal span and some of it is actually also muscles. And the weight anyway seems to be of less significance in this context. My first own kayak was a Mari 41, bought in 2004. 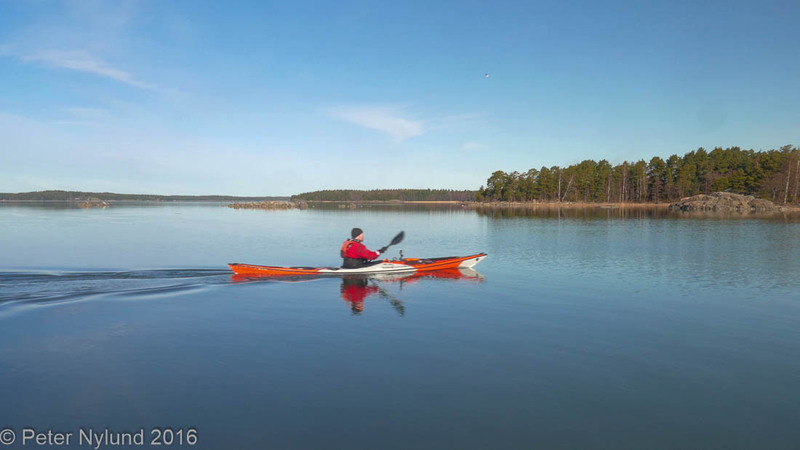 It was a rather cheap Estonian kayak, that was well made and quite comfortable. I've done my longest day distance in it, 100 km from Kaskinen to Vasa, in around 17 hours including a couple of food breaks. I sold it to my brother a couple of years later, when I couldn't paddle due to a badly herniated disc in the lower back, and no time due to two small children at home. The Prijon Kodiak was in many ways an excellent touring kayak. Quite fast, very roomy and stable also in higher sea. The material, blow moulded HTP, is bomb proof and stiff as glass fiber, though not as light. 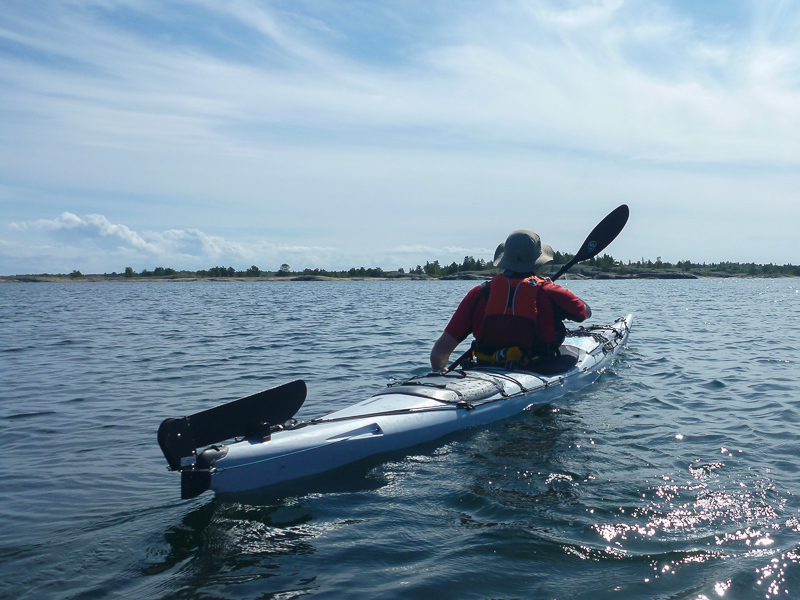 I got more into sea kayaking than I had intended.The trips to the outer archipelago, with its open vistas and barren environment, gave me some of the impressions I sought when going to Lapland or the Swedish or Norwegian fells, with the difference that the archipelago starts from the town where I live and the fells are very far away. I started to look for more in a kayak than just the ability to take me from point A to point B, and then the Prijon Kodiak was no longer enough, It became clear, and not only due to the influence from my instructors, that I wanted a British style kayak, a skeg kayak with good manouverability and a great fun factor. I looked at a number of alternatives tested some and bought an Aquarius Sea Lion, a kayak I'm still very satisfied with. (The one year review is here). The Kodiak was sold. The Aquarius Sea Lion is a like an Italian sports car. It glides very well, it reacts quickly and precisely to manouvering techniques. It rewards correct technique and punishes you if you do something wrong. The initial stability is only ok, not great, and you do not let go of the paddle to take a picture in larger waves. For guiding purposes, where you might have to take care of other people than just yourself, it is not stable enough for me when the sea starts moving. Hence I was still looking for another kayak as well. In December 2015 I bought a Zegul Arrow Play HV, which was almost the perfect kayak, except for maybe the low top speed. The Zegul Arrow Play was almost everything I wanted. What I didn't want, though, was having it fall apart after just six months due to poor quality and too weak a construction. And thus I'm once again looking at alternatives. I want a British style skeg kayak, that is highly manouverable, stable enough for guiding also in higher sea, fast and roomy enough for touring, fun enough to play in waves with, strong enough to take normal (ab)use and the most difficult part, one into which I fit. This kind of kayak is of course a compromise, but not an impossible one. Fitting into one is the crux: I basically want a smallish kayak, into which I fit. There are freight ships, which are roomy enough, but I don't want a freight ship. Since there are no suitable kayaks in Prijons HTP, I want a composite kayak and not a PE kayak. And finally, I want the cockpit opening to be big enough to allow me to get seated first and get the legs in later, since this is crucial for some of the deep water rescues. This is possible in the Arrow Play, but not the Aquarius Sea Lion, even though it has lots of room well inside. The following list is what I've been recommended and have gathered myself. It only contains kayaks that are at least to some extent available to me. Valley Etain 17.7: I've sat in the RM model and the cockpit opening is too short and has the wrong shape. The composite model is supposed to be the same size. P&H Cetus HV: The cockpit opening was much too small when I tested it. NDK Explorer HV: I've tested the ordinary Explorer and it is nice, though too small. The HV version could be of interest, but the cockpit opening seems to small and it probably looses some of its playful properties with my weight. Tiderace Xplore L: The footpegs couldn't be set far enough. With the feet against the front bulk head it could possibly work. This would need to be thoroughly tested. At 4700 € for the reinforced version it is very expensive, but it's on the top 5 list. Tiderace Xcite: Supposed to be the same size in the cockpit as the Xplore L, so it could work with the front bulk head as footrest. Very expensive as well and with touring gear I could be to heavy for it. Tiderace Xplore X: A freight ship, and therefore not interesting. Tiderace Xcape X: The size should be very suitable, but it is supposed to be less playful. 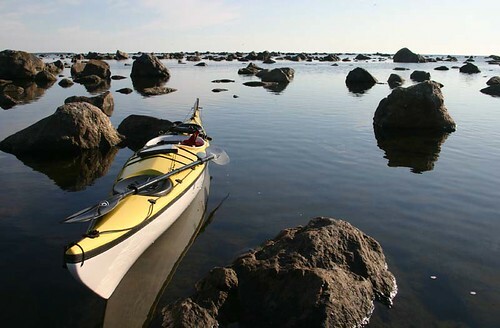 Seabird Scott HV: A fun and playful kayak into which I fit well. Empty it seemed a little high in the water when I tested it, and some of the details I'm not fond of. It is very inexpensive and should still be strong enough. Definitely on the top 5 list. The MV version is too small for me. Kayman Fury: Should be a nice kayak, but I haven't tested it and the cockpit opening is probably too small. 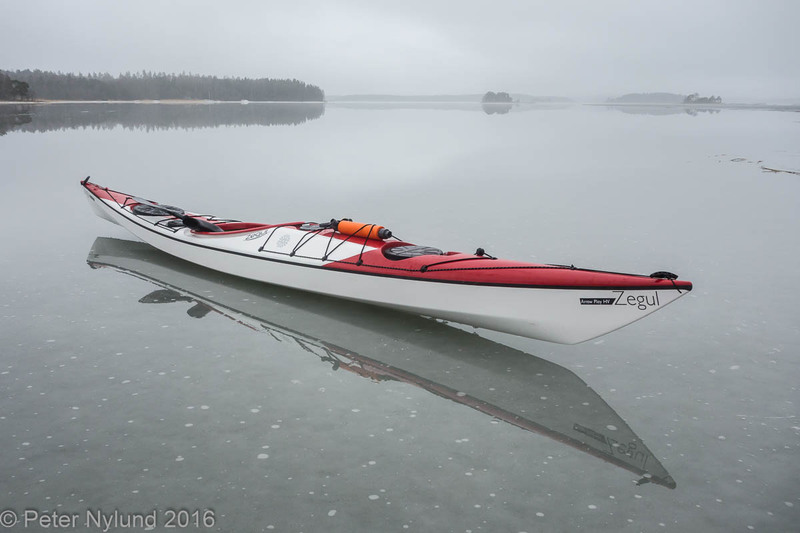 Kayman Smuggler: Big kayak, but too big? I haven't seen it in real life. Rockpool GT: Supposed to be a big kayak, but I had to remove the footrest to get my legs in and it still didn't feel good. Venture Capella 173: Formerly under the P&H brand, this has come up as the first alternative now, in part because Melontapiste can easily provide one instead of the unfortunate Arrow Play. I've tested the composite Capella 167, which was an excellent kayak and just what I wanted, but the cockpit opening and the cockpit where much too short. The longer version might be just right and this is the one I'm currently moving ahead with,. Valley Q-Boat: This was strongly recommended to me, but again the cockpit opening was too short and the cockpit too low for my thighs when I tested it. I'm really much more into actually doing things than fiddling with gear, but sometimes gear ponderings cannot be avoided. I would have been satisfied with the Arrow Play HV, had it been strong enough, but now I'm again forced to use time and effort to find an alternative.